Upon arrival you will meet your guide at the Charlottenburg Palace in the former British sector of Berlin and hear an introduction to the capital's tumultuous history. From there we will continue on to the American sector cruising along the Kurfürstendamm shopping boulevard passing the Kaiser William Memorial Church and the famous KaDeWe Department Store of the West. We will then head through the central park of Berlin, the Tiergarten, past the Presidential Palace Bellevue and on to the new Government Quarter to see the impressive German Parliament, the Reichstag where the Nazis came to power in 1933. After the Reichstag we will stroll through the Brandenburg Gate and Paris Square, the Memorial to the Murdered Jews of Europe and a visit to the adjacent Führer Bunker where Hitler committed suicide in March of 1945. Our last stop before lunch will be Potsdamer Platz, the new “Times Square” of Berlin. We will be dining in Alexanderplatz at the Hofbräuhaus of Oktoberfest fame. Here you will have a chance to sample the famous cuisine of Southern Germany - sausage, schnitzel, roasted pork and spätzle are just a few of the specialties of the house. After lunch it is on to the former Jewish Quarter and the New Synagogue which has become the fashion and art district of the city. We will walk through the Scheunen Viertel or barn quarter where it all began for the Jewish families who settled here in the 17th century. On the walk we will see the oldest Jewish cemetery, the Otto Weidt workshop, as well as the former Jewish boys’ and girls school along with many other monuments commemorating the once thriving Jewish community. From here we make our way to the historic heart of Berlin and an opportunity for photos at the UNESCO World Heritage Site Museum Island as well as a chance to see the Neue Wache War Memorial. A drive along the tree lined boulevard Unter den Linden will bring us past the Book Burning Square and on to Berlin's most beautiful square Gendarmenmarkt. 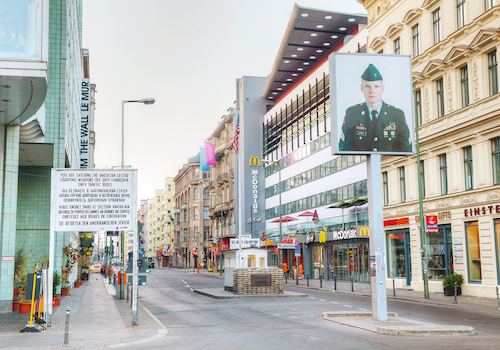 The penultimate stop will be the Cold War Icon Checkpoint Charlie. Finally it is on to the Berlin Wall and the former SS and Gestapo HQ now known as the Topography of Terror. Here we will also have a chance to disembark for photos and to see the museum dedicated to the victims of the Nazi terror.